To pull off an effective influencer marketing campaign you need to work with the right social media influencers. This guide will show you how to do both those things. Not convinced influencer marketing can lead to real business results? A survey by Dana Rebecca Designs found that 72 percent of respondents had made a fashion, beauty, or style purchase after seeing something on Instagram. Take a look at what your potential influencers are posting. How often are they sharing sponsored content? 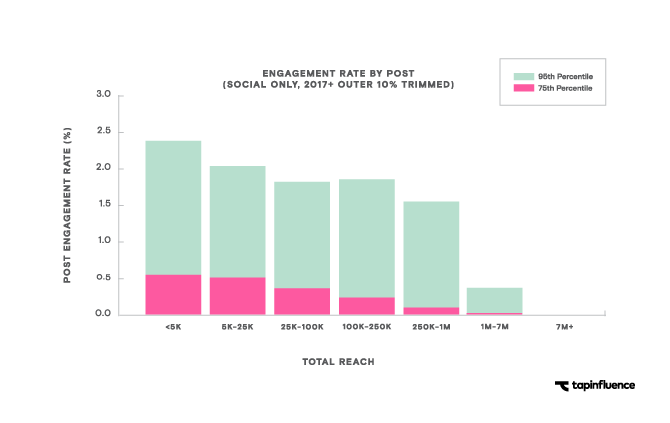 If they’re already hitting their followers with a barrage of paid posts, their engagement rate may not hold up over time. Look for plenty of organic, non-paid content to keep followers interested, enthusiastic, and engaged. YouTube influencer Laura Reid recommends only having one in every five or 10 posts sponsored. Keep this in mind when thinking about what you’ll ask the influencer to post, as well. Asking for too many posts in a short timeframe will make your offer hard for the influencer to accept, even if it comes with a large paycheck. Once you’ve identified the influencers you’d like to work with, it’s time to reach out. Here are some key ways to increase your chances of bringing your most coveted influencers on board. In-demand influencers get lots of offers. When you first approach an influencer, show that you understand what their channels are about, who their audience is, and how the partnership could benefit both parties. A direct message is a great place to start. If you can find an email address, try that too. But don’t send a mass email or generic DM. It may take a little longer to write a personal message to each influencer, but it will show you’re serious about a potential partnership and increase your chances of striking a deal. Influencers with extensive reach rightly expect to be paid for their work. Free product might get you some reviews from those who are just starting out, but a serious influencer campaign requires a budget. Think about what kind of payment structure makes the most sense for your goals, but be willing to consider the influencer’s needs, too. For example, an affiliate or commission structure might be an option instead of a flat fee, or to reduce the flat fee. Remember that micro-influencers will have more flexible payment terms. Before you dive into influencer marketing, it’s important to understand the rules set out by the Federal Trade Commission. The FTC takes disclosure very seriously. Make sure you build disclosure guidelines into your agreements with influencers. 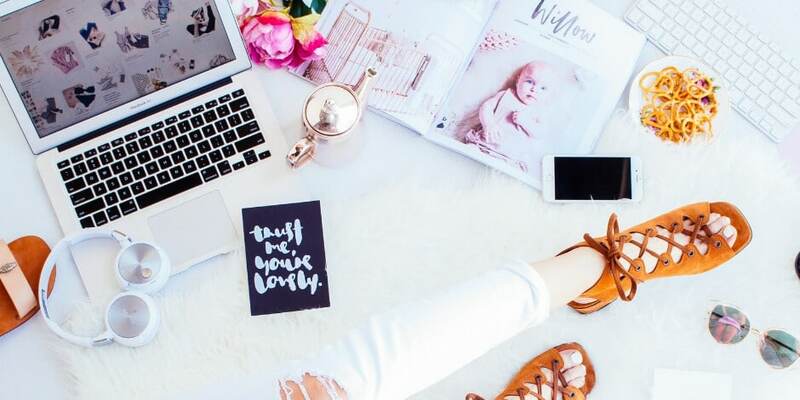 Even though influencers are required to identify sponsored posts, a survey from Zine found that 41 percent only label content with tags like #ad or #sponsored. And that’s only when they are asked to do so. Video reviews must include both written and verbal disclosure of the partnership in the video itself (not just the description). The built-in tools on social media platforms are not enough. #ad and #sponsored are great hashtags to use for disclosure, but make sure they’re highly visible and not just tacked on to the need of a long string of tags. That last point is an important one, since some influencers may be wary about putting the #ad or #sponsored hashtag right up front. But it didn’t limit engagement on this sponsored post for 1850 Coffee by Daniella Monet, which garnered more than 28,000 likes in the first 12 hours after it was posted. #ad You guys know how I feel about my ☕️ – obsessed. Well, today I decided to really enjoy the new @1850coffee, it’s my first time trying it and I’m in love. 1850 coffee gives me the perfect boost to get my hustle on. If you’re a coffee (and chocolate ???? ) lover, the Black Gold Dark Roast is for you. I even made a little extra so I can throw it over ice later ???? You should also request that the influencer to send you detailed reports on the reach and engagement levels of their posts. When you launch your influencer campaign, it can be tempting to focus on vanity metrics like likes and comments. If your influencer has a much larger following than your own, you might feel a little dazzled by the sheer number of likes that can rack up. To measure the effectiveness of a campaign, you have to understand its value in terms of return on investment. 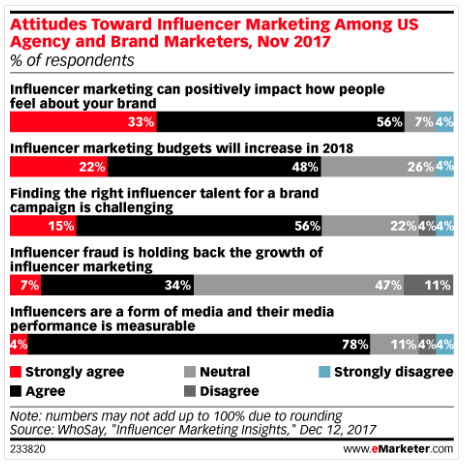 According to a survey by Linqia, 76 percent of marketers said measuring influencer campaign ROI was their top challenge for 2018. UTM parameters are one way to track the visitors an influencer sends to your website, as well as how much engagement the campaign receives. When you assign each influencer their own unique links with UTM codes, you’ll get a clear picture of the results. And that allows you to calculate the impact on your bottom line. For example, when Instagrammer Christopher Chung worked with Ted Baker Menswear, he directed followers to the Ted Baker link in his bio. The link contained UTM source and content parameters, which showed Ted Baker Menswear how much traffic came from Chung’s posts. You should also request that the influencer to send you detailed reports on the reach and engagement levels of their posts. This is especially important for channels like Snapchat and Instagram Stories, where engagement happens out of the public view. You can find more great influencer marketing tips on our guides to working with Instagram influencers and YouTube influencers. Clarify your goals and determine what types of influencers you should reach out to based on those objectives. This tool from Moz allows you to search for relevant influencers on Twitter based on keywords and location. It’s a great first tool to use when building your list of potential influencers to engage and partner with. Hootsuite search streams can also help you discover influencers by monitoring conversations relevant to your industry across multiple channels: Twitter, Facebook Pages, Google Plus, and Instagram. Once you have an initial set of influencers in mind, add them to a stream to track what they share and who they engage with. This will help you understand their relevance to your audience while also highlight other potential influencers to work with. Once you’ve built your list of potential influencers, use the data from Demographics Pro to check for a demographic match with your brand. The app shows you the demographics of any Twitter user’s followers, including gender, average age and income level. You can even find out which cities most of those followers live in. This allows you to make sure the influencers you choose speak to the exact audience you’re trying to reach. This app helps you find trending photos, videos, and influencers on Instagram using relevant hashtags and topics . Then, you can research the creators of that top content to find out whether they’re a good fit for your brand and your particular campaign goals. It also integrates with Hootsuite. This app can search out top content shared by influencers based on topic and location. Use to identify thought leaders and discover potential influencer partnerships based on the quality of the content they share. This Google-owned platform connects brands with YouTube influencers. Tell it what kind of content you’re looking for, the kind of sponsorship you’ll provide, and your budget, and content creators will send you proposals to review. There are several platforms to help brands connect directly with influencers on other social networks, including Tapinfluence, Upfluence, Revfluence, Linqia, and #paid. Make your influencer marketing activities easier with Hootsuite. Schedule posts, engage with influencers, and measure the success of your efforts. Try it free today.